Cakes N’ Dreams 50’s Diner & Dessert Parlor Restaurant is a good place to dine in with your family or friends after enjoying an entertaining live show in the heart of Branson. This great restaurant will take you back to the old days of cool cars, cruising down to the Malt Shop to snap burger and fries and a nice big milk shake. For over 30 years, this awesome restaurant is a favorite place to dine in Branson, where folks come back each time to enjoy a variety of sweet confections of the award winning restaurant for its beautiful ambiance and great customer service. In this 50’s Diner Restaurant, they serve freshly baked pies, the best funnel cake, and a wide variety of ice cream treats, shakes, banana splits and more. Cakes N’ Creams has something for everyone desiring for sweet treats. But this restaurant is not just peddling sweets. Cakes & Dreams 50’s also offer burgers, pizzas, fries, and so much more. Beautifully located near The Baldknobbers, The Presley’s, and other favorite places in Branson, Cakes N’ Creams is a great choice to grab a bite before watching live entertainment show in some theaters in Branson. Cakes N’ Creams achieved a successful restaurant business in 34 years, because it truly offers a unique dining experience for every customer dining in this restaurant in Branson. Once you enter into this dining place, you will feel a stepping back in time, as you see the 50’s with bright and cheerful things with a whole lot of fun. A great dining experience can be felt through three essential offerings: a fun and diversified menu; great customer service; and a unique dining atmosphere. The first offering of the restaurant is focused on the menu that includes burgers, French fries, and funnel cakes. These items are not only delicious, they are also a work of art. 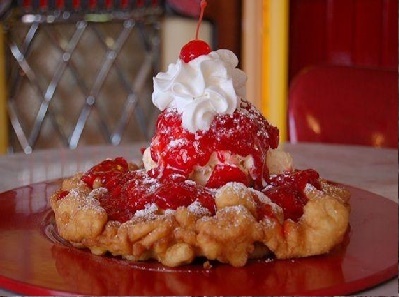 The funnel cake is the restaurant’s signature dessert. There’s no other restaurant that produces delicious treats like how it’s done here. This sweet treat is topped with luscious ice cream and piled with whipped topping and succulent fruit. The cream pies are prepared with the finest ingredients and topped with a three inch meringue that even non-pie eaters draw positive comments. The success achieved by the restaurant has also something to do with the extraordinary customer service of the staff. Giving excellent service to customers is an important marketing tool for every business. It includes cleanliness of the staff and the quality of service the customer will get. The success of the restaurant is combined with warm and friendly service with a unique and relaxing dining atmosphere. A new “spin” on the 50’s theme is in place with authentic Wurlitzer jukeboxes, 45 records and lots of shiny brass and chrome and eye-catching red decors. So, if you want to experience a great bonding moment with your family and friends after an entertaining show, dine in at Cakes & Creams 50’s Diner & Desert Parlor Restaurant in Branson.